A photographic exploration of the town of Hyde, Cheshire, UK. A continuation of Hyde Daily Photo. 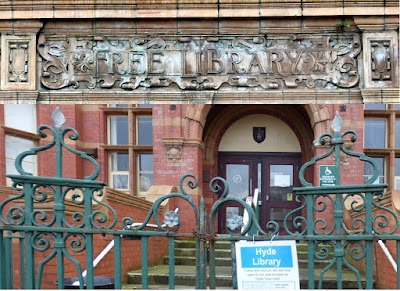 Hyde Library was originally Hyde Technical School and Free Library. The foundation stone was laid in 1897 and it opened in 1899 replacing the former Mechanics Institute. 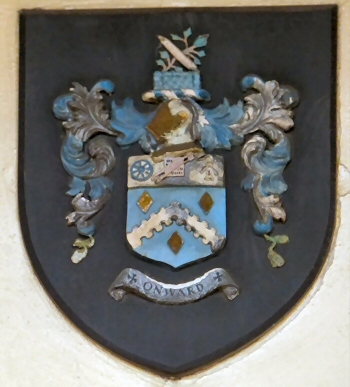 For more information see Hyde, Cheshire. In recent years the building was shared between the library and Tameside College. The library was extensively refurbished in 2006 and a gallery to local artist Harry Rutherford installed. However in 2012 the gallery was moved to the Central Art Gallery in Ashton-under-Lyne. In a first round of "council austerity cuts" the public were presented with three "choices" regarding the future of library services. Smaller local libraries were closed in the light of promised improved facilities at main libraries such as Hyde. At the beginning of 2015 despite earlier local protests the "library services" were transferred to some cramped rooms inside the Town Hall. Despite its historic importance to the town it is not a listed building and as the local council view it as an "under-used asset" its future is insecure and a future sale and demolition remains a possibility. See the original plans for the library on Old Hyde. See a view from across the adjacent car park on Hyde Daily Photo. A contribution to ABC Wednesday. You've made me realise I've never posted an image of my own town library which doubles as the town hall. Thanks for the prompt. Even in this day and age libraries are invaluable and should never be viewed as under used. Unless otherwise stated, all photographs on this site are copyright © 2006, 2007, 2008, 2009, 2010, 2011, 2012, 2013, 2014, 2015, 2016, 2017 Gerald England. In most cases, clicking on the photograph will reveal a larger-sized image. A Wood Pigeon Waits for Spring - What more is there to say? © Photo & Text Copyright Gerald England. All rights reserved, including reproduction or republishing. ARE YOU SURE YOU ARE THE RIGHT PERSON FOR THE JOB? Why are Stockport Council wasting more money on consultants? The cactus magician does it again! Weaving Yarns | Heather Wastie writes poems, songs & monologues. This blog focuses on her oral history project with people who worked in the carpet industry in Kidderminster. The British Isles are the limit, but soon the world! | The adventures of a couple consumed with wanderlust. So many years without posting!